Life is anything but normal on Outpost Zero. Could it be because of an anomaly beneath the Outpost? Let’s take a look at Outpost Zero #8 from Image Comics. 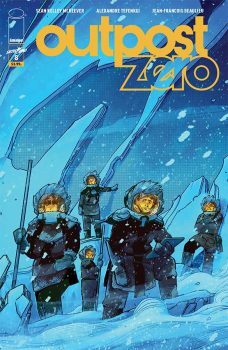 Previously in Outpost Zero: Finally the drilling team breaks through the ice and can start the work of clearing the dome. Karen talks to her mentor, Doctor Xi, who is dying. She once had a relationship with Sam’s father, and is struggling with the issue of what to tell him, and when. Mitchell wants to know what everyone is up to, and asks Lyss, who won’t tell him because it isn’t her secret to share. Sam figures out how to turn a cleaning bot into an explorer bot, and they feed it down through a grate into the underpinnings of the Outpost. At the end of its rope, it still hasn’t hit bottom, so Alea cuts it free. It lands in some liquid, and keeps sending back images. The last thing the young people see is an enormous creature. 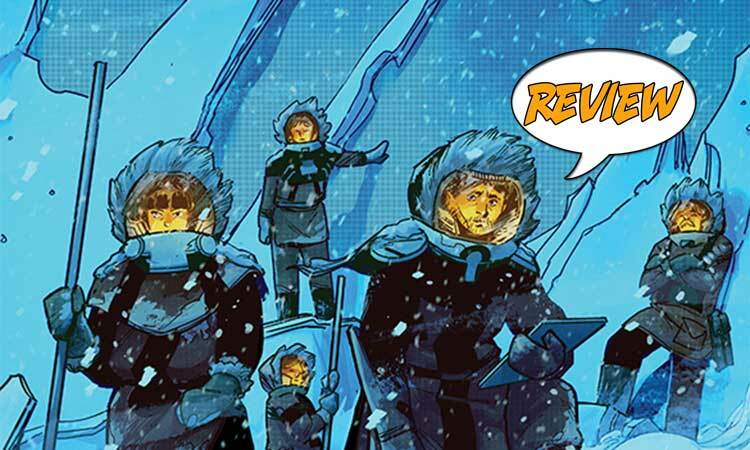 Outpost Zero #8 starts out on the planet’s surface as the team slowly works on their plan for using the laser to clear the ice from the dome. When the laser is fired up, it’s much too strong. A couple team members are knocked down and one, Kaanan, moves into the path of a possible avalanche. They shut the laser off, and there are some discussions/accusations hurled about the calibrations, but Kaanan trips and falls into ice chunks hard enough to shatter his helmet. In his panic, he can’t move, is caught in a deluge of ice water, and drowns. As horrible as Kaanan’s death is, I like the way it plays out. This is ultimately an accident, and the smallest things contribute to it. People react in different ways, and some are better able to keep their cool than others. It is not as flashy as a physical fight, but it can be just as intense. After this event, we catch Sam at night, at the monument to the dead, talking to Steven about it. He realizes now that he really does not want to die, but he still feels as though he does, and he does not understand this. Lyss comes upon him. She is having trouble sleeping because of the thing they saw below the Outpost, the thing that none of them have told anyone about. But she feels it is not safe to keep exploring. Alea has reacted by becoming even more stir-crazy. Her parents were on the outside for days, and she felt helpless. People have been checking on her and her sister, so she can’t get back to her explorations. They lost their recording last time because Sam dropped the tablet in shock; she wants to try again. At home, her parents talk about discovery team needing to meet with security team about their next plan. Alea’s impatience shows here too. She is not content with mere survival. The lights go out, and now we hear more about the power fluctuations they’ve been having at the Outpost. Kaanan had been working on them and thought he’d figured something out. But now he’s gone, and we’ve been starting to realize that even though they have a lot of tech, not a lot of the people still here actually know how it works. Alea’s parents aren’t sure there is anyone else who can work with Kaanan’s data. When Karen meets with the teams to decide what to do next, Alea goes into Kaanan’s office and looks at his data. And she realizes something. That night, she gets Sam to come with her to the edge of the dome, looking out over the outpost. She jumped from here (in Issue #1) because she’d calculated that she would be able to do so and survive due to the gravsync. It didn’t work as she planned, because the anomaly affected her calculations. She knows where the anomaly is, and she has redone her calculations. If someone runs and jumps off, they should be able to survive the jump. As Outpost Zero #8 opens, it is a calm and relatively beautiful day, if any day can be beautiful in such unforgiving surroundings. The outdoor scenes really show us the scale. As big as the outpost is, as big as their ship must be, they are tiny compared to the planet. The ice covering the dome is immense, and the team working on this is only half a dozen people or so. There is a great sense of stillness until the laser is fired up and things start going wrong. I also like the sound effects through this section as there is a variety of them and they help us really see what’s happening. The sky projection inside the dome is working again, and I do like the interior scenes. They look so calm and peaceful, and as the tensions grow, the contrast between that and the prettiness becomes ever more striking. Looking down over the outpost from the rim, it looks so calm and orderly. And only a few people even have a suspicion that there is something below it all.